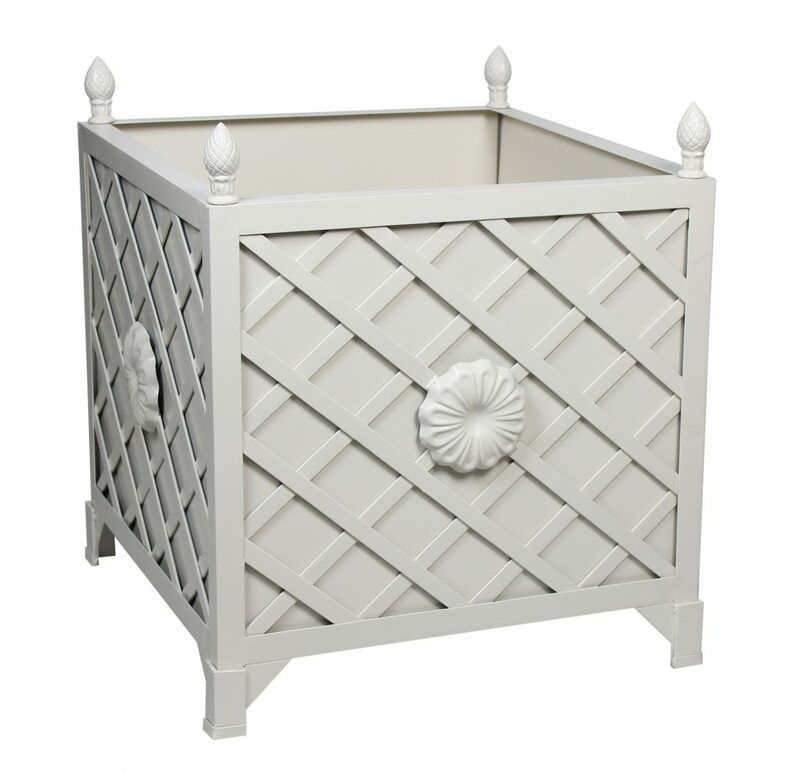 The May chinoiserie tole and Provence planter presale and a giveaway! Please email us at info@enchantedhome.com to let us know your shipping information so your gift wrap can be on it’s way! 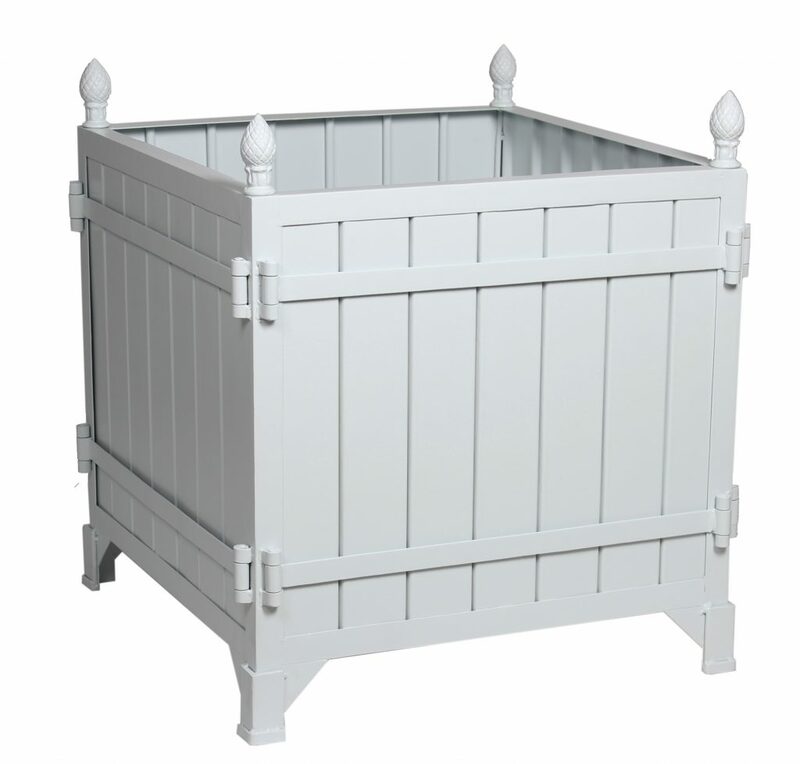 As we speak, a new beautiful chinosiserie tole and Provence planter container is en route and due here about May 30th. We are offering by popular demand, both mossy green and red mirrors as well as a return of the gorgeous blue/white mirror colorway. These items are a mere fraction of what they are elsewhere. Also getting in more fabulous tray tables and by popular demand our spectacular Provence planters, which are the lowest prices around. They can retail for thousands so I am sure you will recognize the exceptional deals here today. Because I now directly import, you are saving the cost of the infamous “middleman” and I can tell you that is A LOT! OK ready to see the goodies? And here we go……. ITEM 4 Provence planters. Getting in another round of these gorgeous metal planters just in time for the warmer months ahead when we will all be busy beautifying the outsides of your homes! These are spectacular by a front door, on a patio and by the pool. They each have four holes for drainage and are painted a weatherproof paint. ITEM 6. NEW!! Our fabulous tray tables are incredibly beautiful…..so much more in person if you can believe it. I love them and they are a classic that will be part of my line permanently! 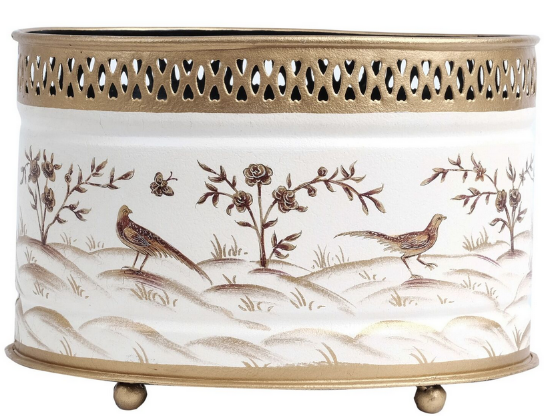 One lucky chinoiserie tole loving winner will win this beautiful tole planter. All you need to do to enter is leave a comment on this post telling me your most favorite item. I will announce a winner on Sunday. To place an order just call or email it in. Remember if you email your order request you must provide your name, address and phone number. This offer is in for 3 days only and the items will ship within 2 weeks. Thanks for stopping in, wishing you a wonderful day and a great start to your week! 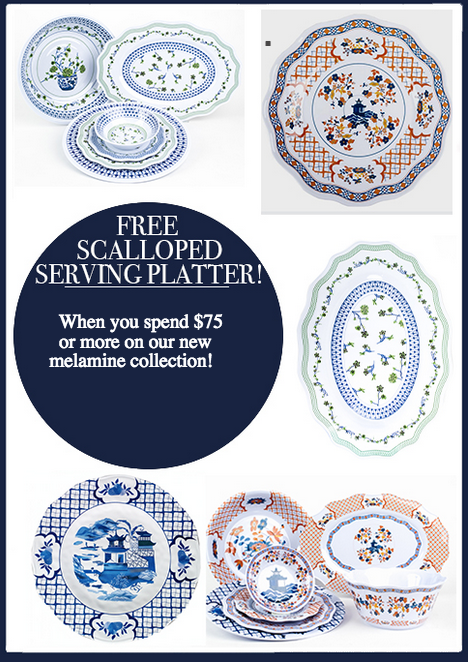 PS Also for today and tomorrow- purchase $100 or more of melamine and you will receive a free scalloped platter ($30 value) Click here to see all melamine. Love the mirrors! Measuring for my guest bedroom right now! My favorite today is the black and gold tray table. It is exquisite! I want to redo my master bath around 2 of those mirrors. I love your architectural pieces! 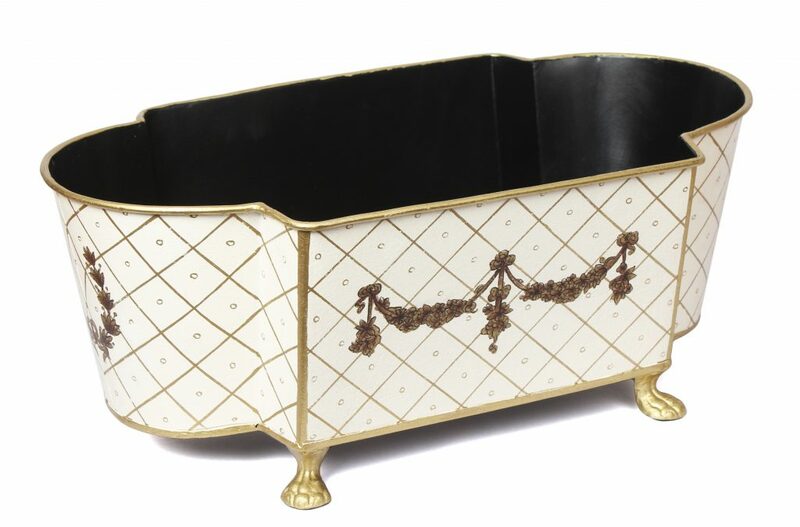 I love the ivory/gold toke planter. A very versitle piece! The green and gold mirrors…it’s the same gorgeous colors as the Royal Wedding portrait! Too many yummy choices, as usual, Tina! 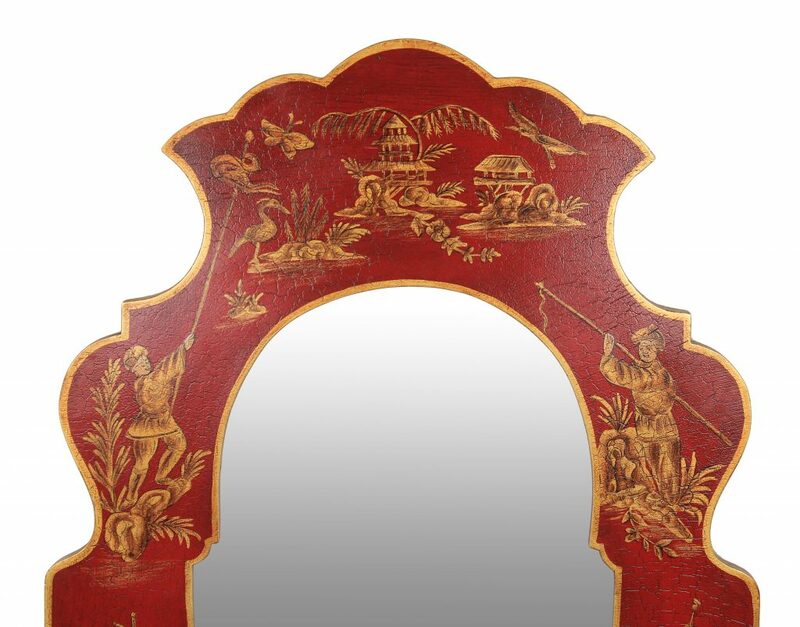 I’d have to choose the Chinese red floral/vine Chinoiserie mirror, although the original paneled Provence planters are wonderful! Just have to figure out how many I need! Item #5 is my favorite item. Everything is fabulous, but the tole table speaks to me! 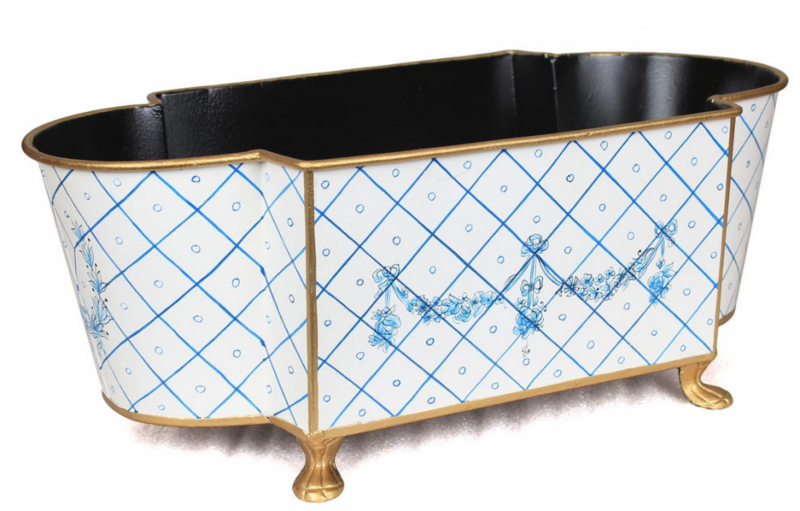 The new ivory and blue tole planter – beautiful! I am “in love” with the Provence Planters. I always love to see how you decorate your own home with these beautiful items. My favorite item is the Provence Planter. I especially love the ones with the flower detail. They would look amazing on my new deck! Tina, good morning! I LOVE the new tea tables, they are gorgeous! And the mirrors would be fabulous in any room. I love the tray tables…ordered one last month and can’t wait for it to arrive!! As always, the Provence planters are beautiful. I would love to be reminded of the dimensions of each size. Love the blue/white and gold mirrors!!! The mirrors are fabulous!! Lots of bang for the buck ! Always pretty things to look at. Thanks! Love all the tole items but especially the ivory and gold ones and the black and gold tray tables-so many uses in a variety of places! 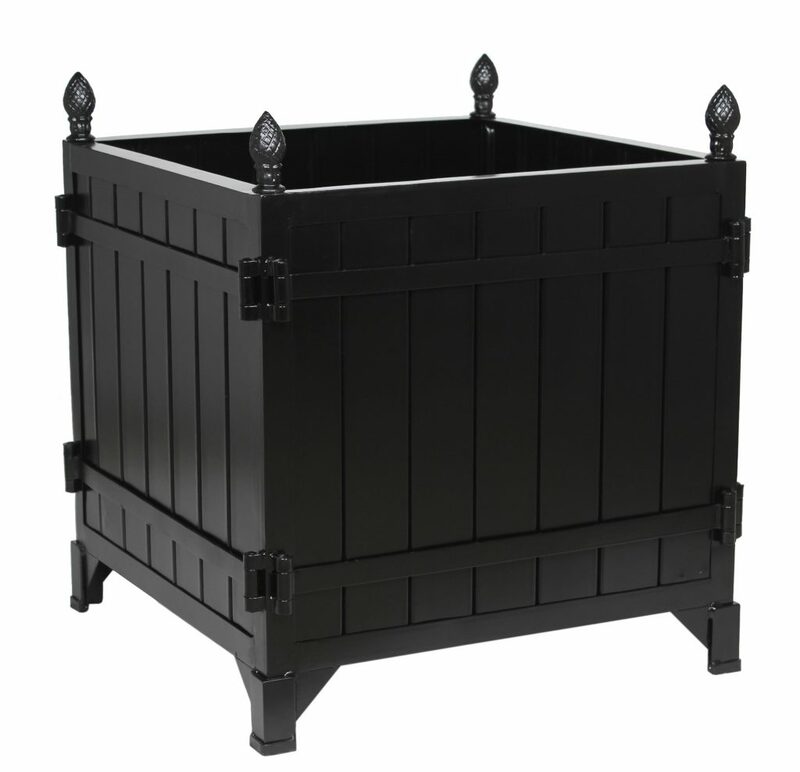 I could use two large black Provence Planters at my garden gate, so item 4 is my top choice right now. I am loving the Blue and Ivory Tole planter. My orchid would look lovely in it. LOVE the black and gold tray table! Just gorgeous! Love the planter boxes…My favorite! Oh goodness! Item #1, Tole Planter is so perfect for so many things! Just need to decide on a color! Beautiful, beautiful offerings! All of this is beautiful! It’s hard to choose a favorite item but I could use the tray table in either color. Beautiful workmanship! Such beautiful choices make it hard to decide! WOW!! Fabulous collection. 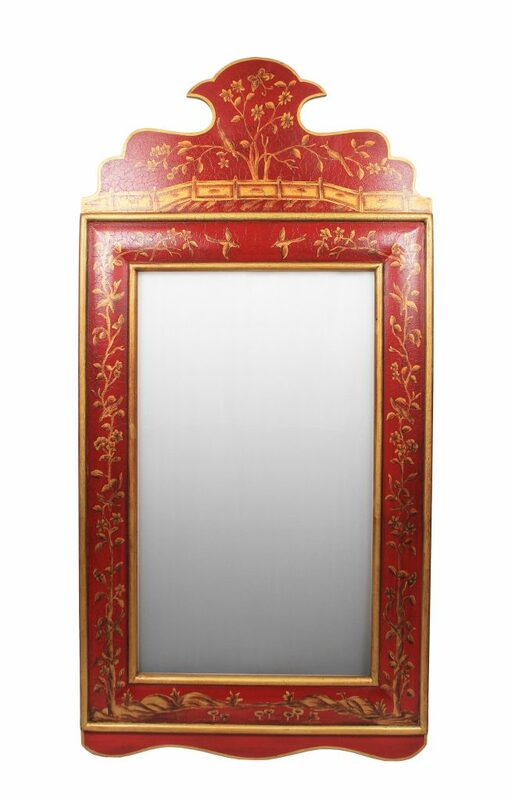 I’ve been looking for the “perfect “ mirror for one of our guest bedrooms and I’ve just found it. Can hardly wait to receive it. Thanks!!! 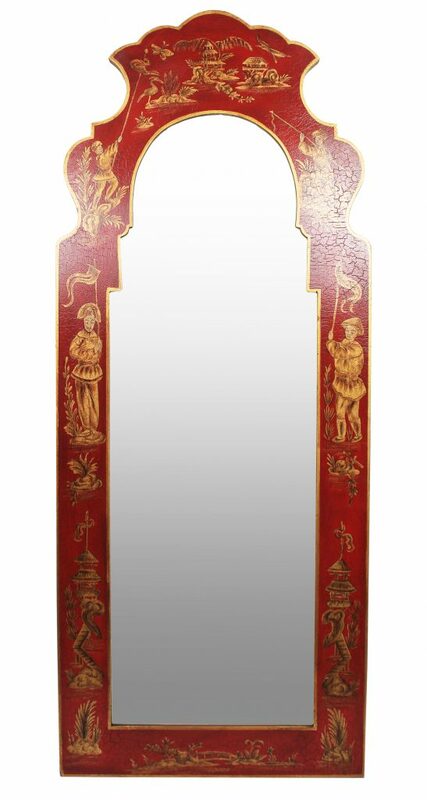 Your chinoiserie figurine mirrors are beauties! The green & gold is exquisite! The mirrors are great but then everything else is too! Love your style! I adore the tray tables! Great tole items! I can attest to the quality of the mirrors since I own 2. I am in love with the ivory tray tables. Well I’ve bought TWO monogrammed trays, so TRAYS it is!!! The tole planters are so multi functional and lovely!!! Item 1, very nice! Timeless! 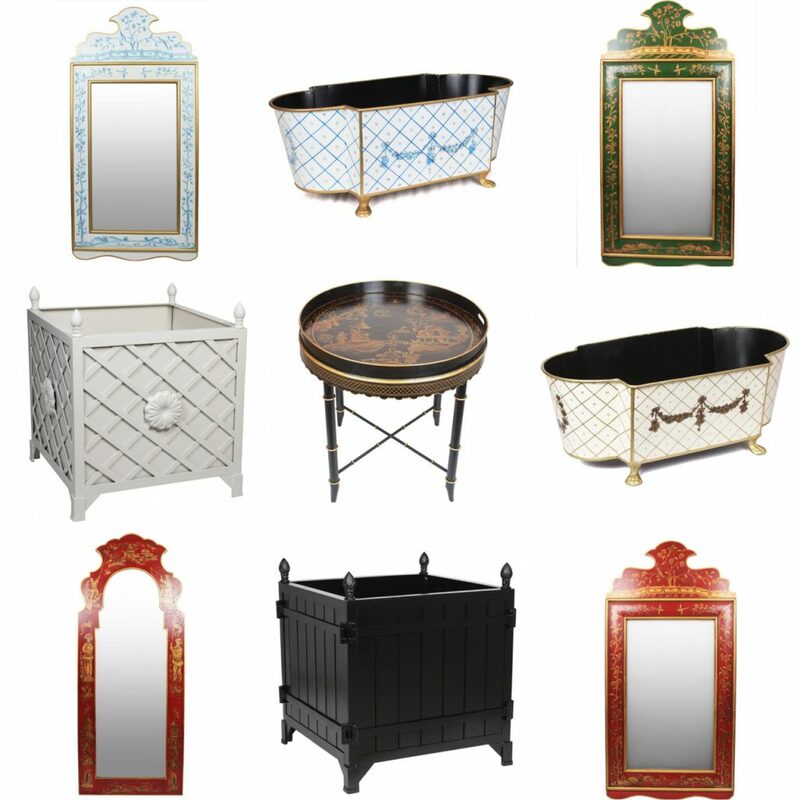 Love it all but the Provence planters and the mirrors have to be my favorite. I am measuring my new powder room redo to see if one of the green ones can fit, I love them. Nice job Tina! 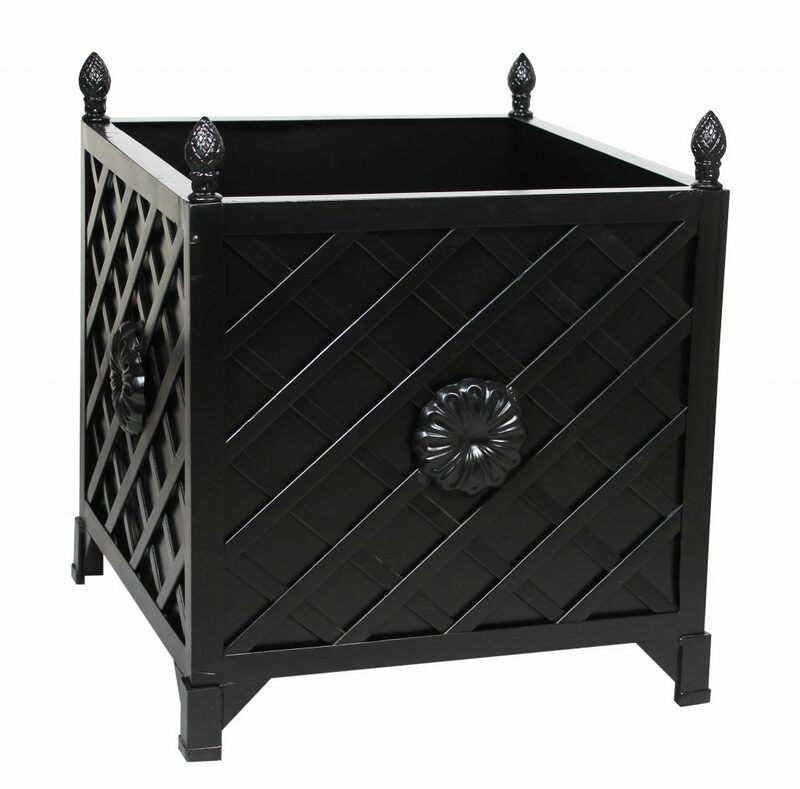 My favorite item is black provence planter. Would like them all over my yard. 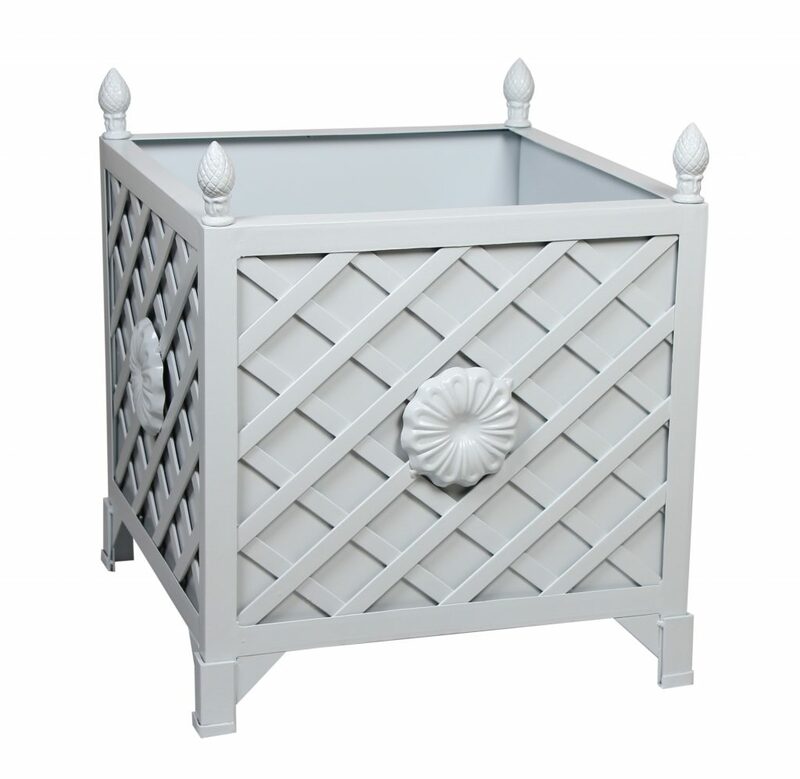 I love the Provence planters., me favorite is the pale gray/blue. The red mirror is exquisite. What a beautiful addition to a powder room or hallway. Oh my, how to decide. I love the Provence planters but also the Tole tray tables!! 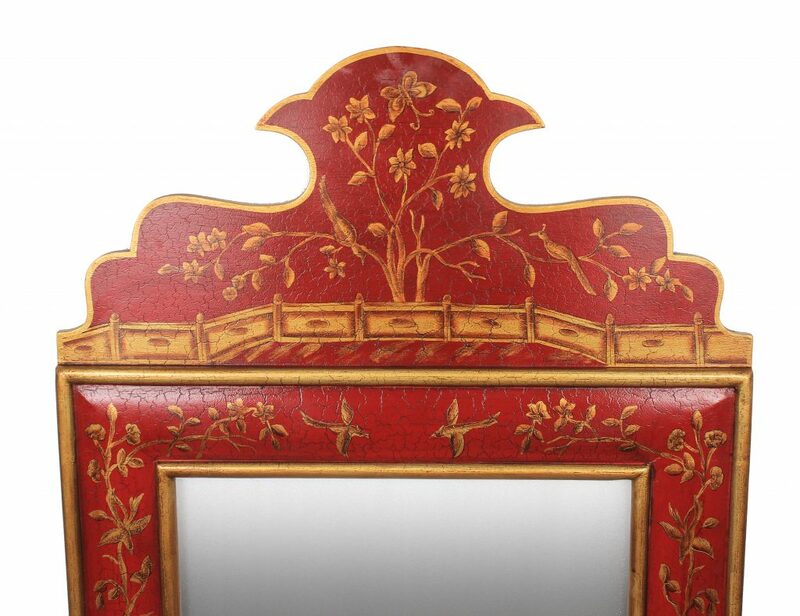 The red chinoiserie mirror is beyond stunning—both styles! It’s all fabulous! But, I really adore the ivory tray table! Really hard to decide my favorite. The mirrors in my bathroom. The trays. Probably the Provence planter! Maybe next time ask for the least favorite! 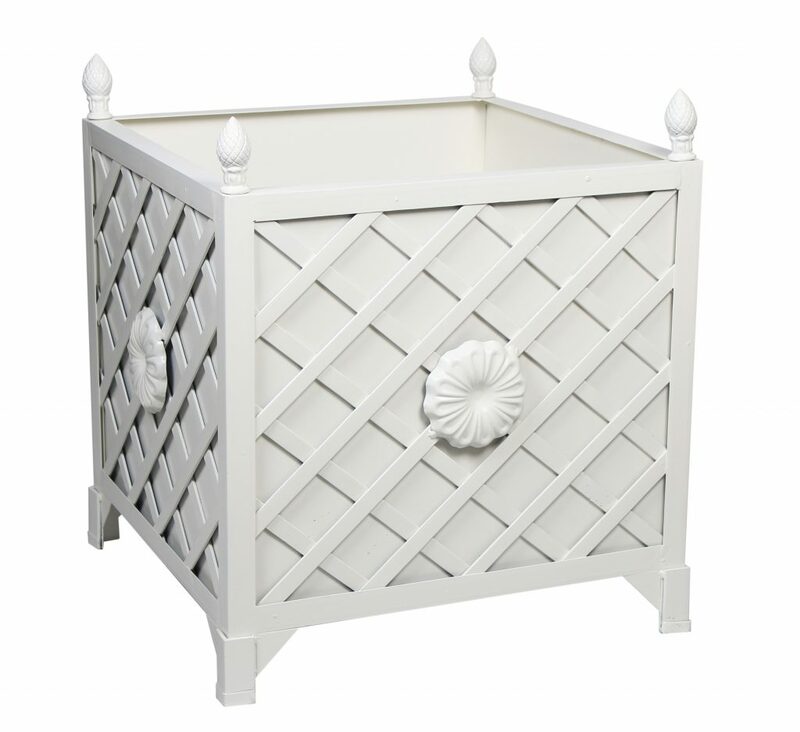 Love, love item number 5, the planter with the lattice! All of the choices are stunning, but the floral/vine chinoiserie mirrors in red or green scream out to me for a powder room. I currently have a similar one in my entrance hall, but yours are prettier! ❤️❤️❤️The giveaway piece, the soft white and gold are so pretty together. The melamine is gorgeous. I especially love the blue and green. 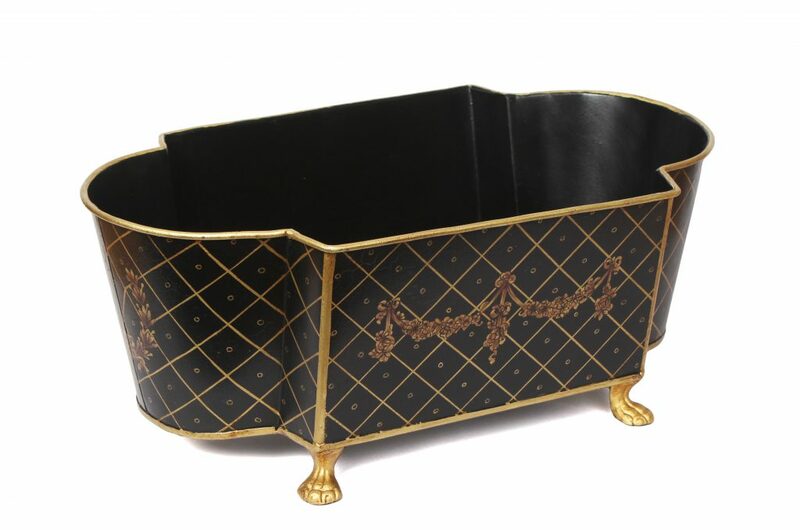 Also crazy about the black French Planter. The tables are my favorite! I love the Provence planters! But I would call them Versailles planters because I have photos of HUGE planters just like that taken outdoors in the GARDEN/PARK the year I visited Versailles….swoon…. Adore ALL of it! Would like a mirror in every color!! Those tray tables are GORGEOUS!!! I absolutely love the black tole tray-table! Such an elegant piece! It’s a tough call, but I think the ivory tray table is my favorite! Love the black tray table. Oh my goodness! These are all beautiful! If I had to pick my top two favorites are the new planters and the tray tables. LOVE the blue mirrors!!!!!!!!!!!!!!!!!!!!!!!!!!!!!!!!!!!!!!!!!!!! And everything else too!!!!!! I’ll take one of everything! Maybe two or three! All of the mirrors are just incredible! Bravo!!! I equally love the red and the green. The tray tables are gorgeous! The mirror is my favorite – would love it in a powder room. Love the blue and white mirrors AND the new ivory/blue tole planter to use as a wine cooler!!! Just ordered mine! Love the white and gold tray tables! The tray tables are absolutely fabulous! Love the ivory and gold tole planter for all the hydrangeas that are about to reach their prime. Thanks for the idea of using it as a beverage cooler because my wicker wine cooler from you is now filled with magnolia blooms. As always, I love everything, but the Provence planters are my favorite. Love the mirrors in all of the colors! 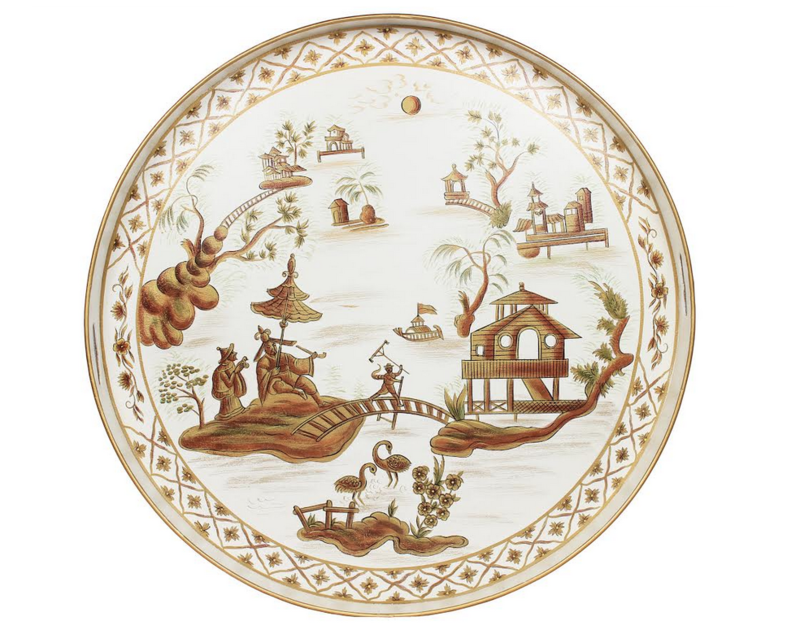 Chinoiserie is classic and these pieces are stunning examples. The tray table is especially useful in so many situations. love,love,love the blue/white mirrors. wish they were not so high for my normal sized ceilings. My most favorite is the tray table. Any color. I love them all. I love the table trays! With the summer season in place, the planters are a perfect addition to all homes. I love the ivory planter. I like the pale taupe planter. I prefer the ivory and white planter. The mirrors are fabulous. Was reading through your old posts and noticed tole planters with horses. So pretty, would love to have (as would several of my friends here in Kentucky.). Any chance of the return of equines? The tray tables are beautiful. Have you thought about doing it in blue and white? I love the oblong tole planters and tray tables! Absolutely love everything! 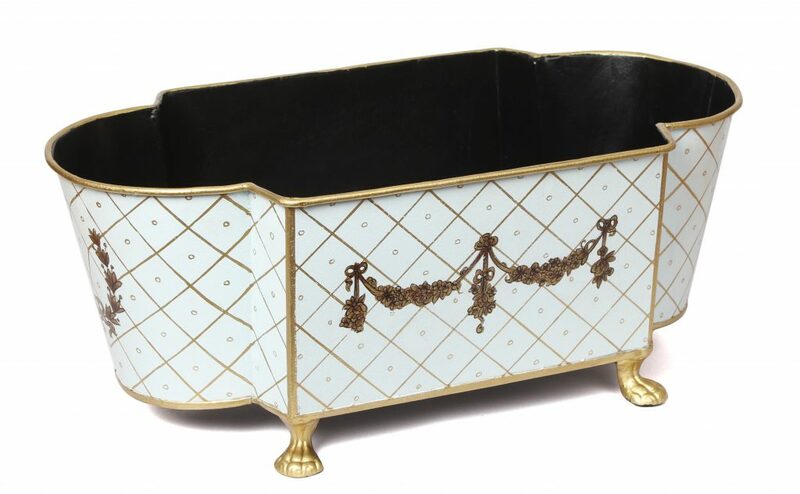 If I have to chose a favorite it’s the ivory and gold planter. 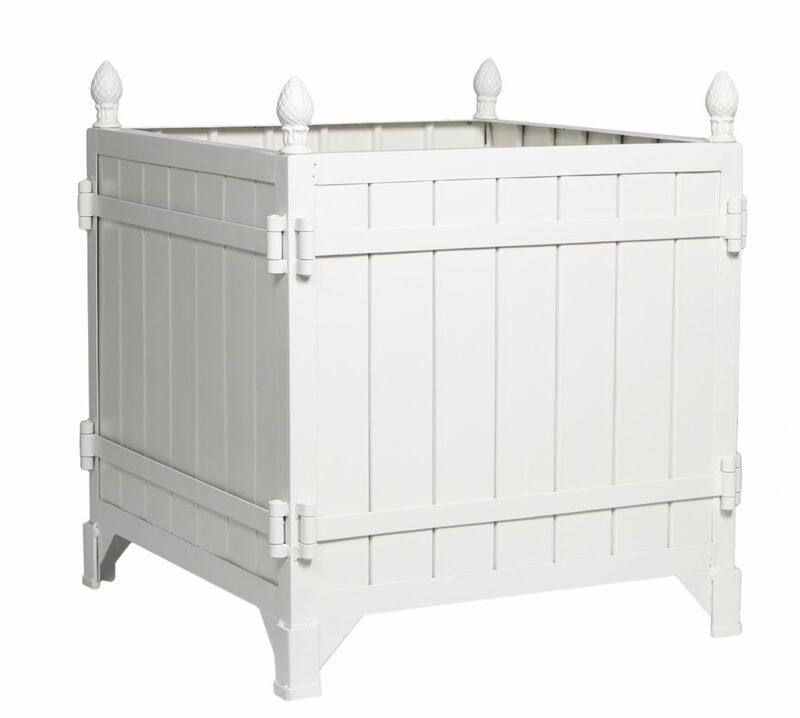 Love the idea of filling it with hand towels for the guest bath or to hold wine at a party!! I think it has to be the ivory/blue planter…or maybe the pale blue/gold…I can’t decide, but I need one of them for champagne! I love the planters. They are really nice! 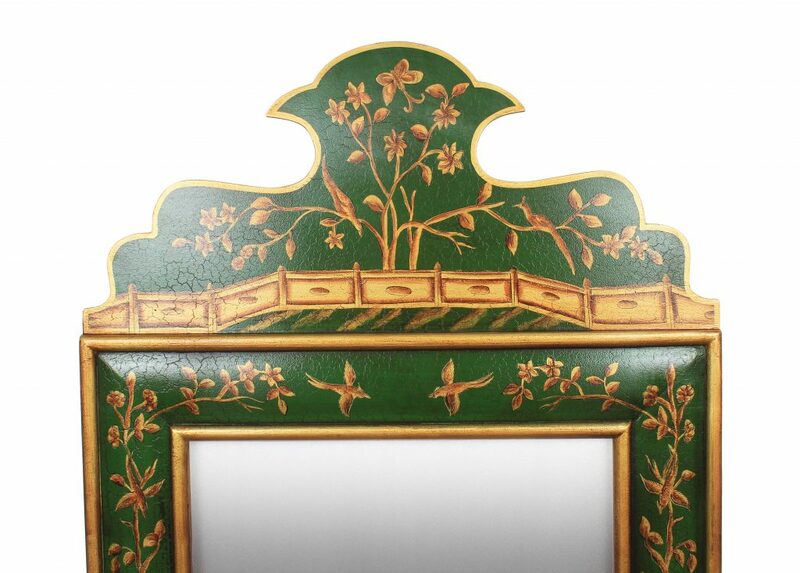 I love the green/gold chinoiserie mirror!! So beautiful!! Everything is so beautiful. My favorite is the gorgeous ivory tray table. I’m torn between the planters and the tray tables… Planters are such a classic style and the black tray table is beautiful ( a touch of black in a room just makes a room special) Can’t make up my mind! Absolutly love the black tray table! Love the fact that the tray is removable. my favorite is the tray table!!! It will be sooo versatile and solve a world of serving needs!!! 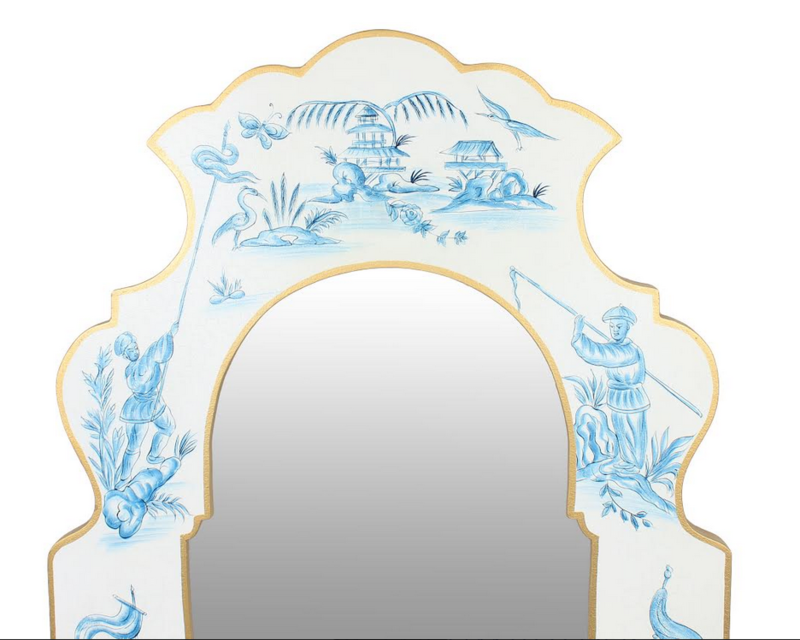 Absolutely love the chinoiserie vine mirror in blue & white. I’m refreshing my granddaughter’s bedroom in my home and want to use the mirror in her new room. My favorites are the Provance Planters in Blue/Gray. . They remind me of my trip to Versailles. First of all, thank you for the opportunity of possibly winning your giveaway. We, hubby and I, are currently renovating a home that hasn’t been lived in for 10 years and my initial ideas were to incorporate small doses of chinoiserie throughout the house. 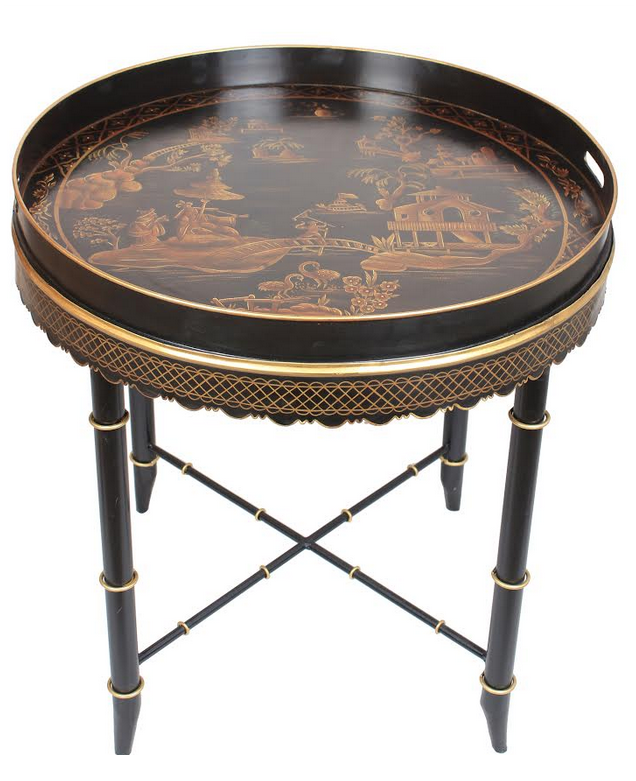 I have a Ralph Lauren bamboo cocktail table in black, limned in gold, very simple, without embellishments. 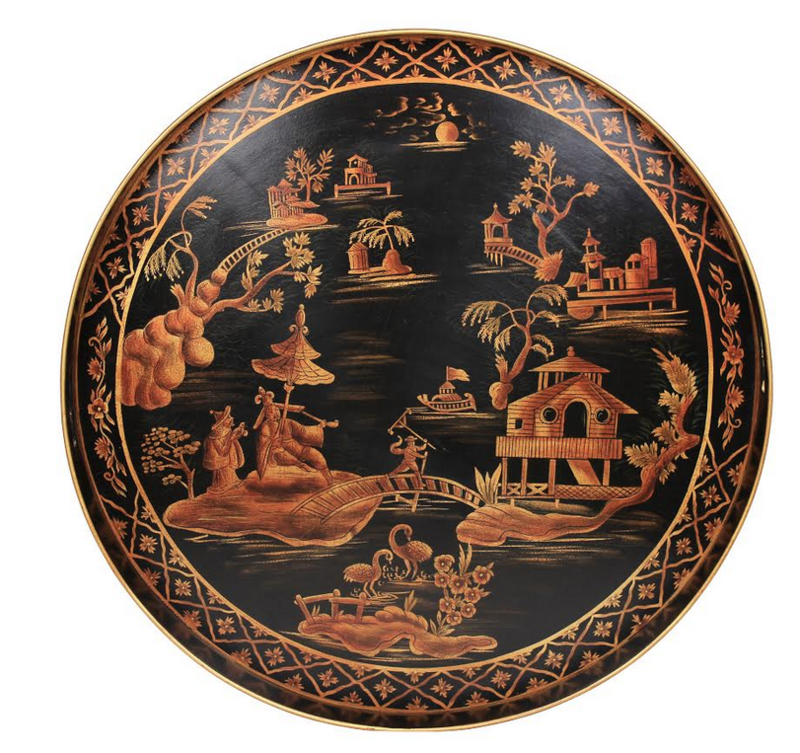 My favorite would be the black and gold chinoiserie tray table to complement it. Needless to say, this reno will take some time, but when it’s finished I plan to sit back and offer a Salud! while I enjoy a Rose’ in our new home. The mirrors would be lovely in my powder room! So many beauties! The planters are calling my name! 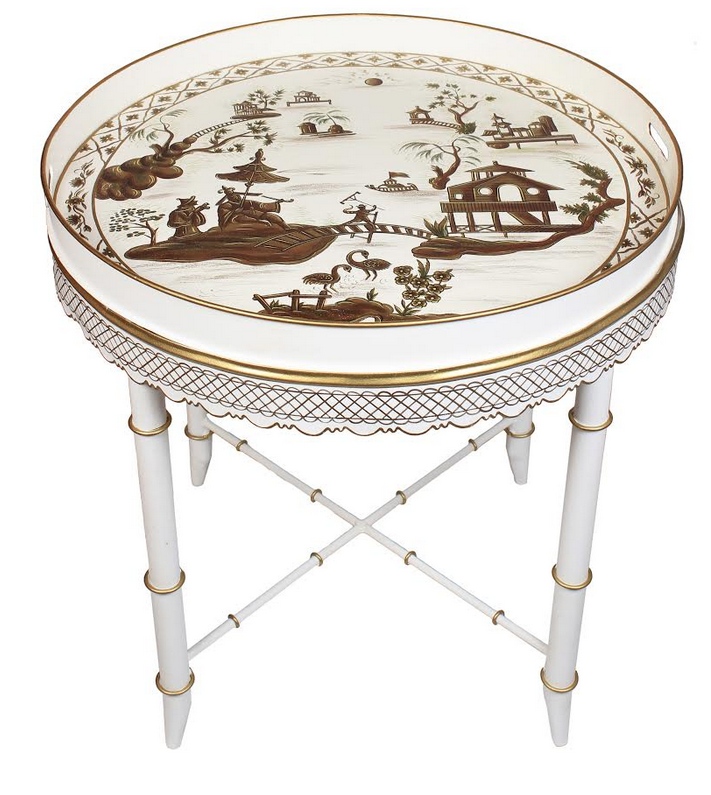 Favorites are the ivory tray table and new chinoiserie figurine mirrors!!! 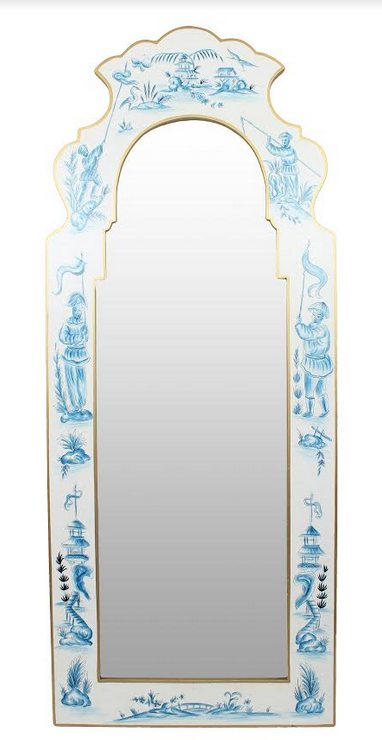 My most favorite is the blue & white chinoiserie figurine mirror. I love love love the black tray table! Elegant and a reminder of time passed. 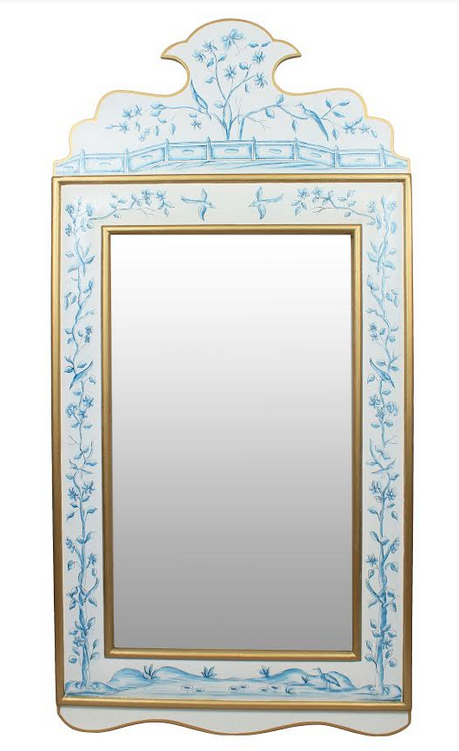 I’m loving the chinoiserie tole mirrors, especially the floral vine chinoiserie tole mirror. Gorgeous! The black tray table is lovely. 4A……the planter. Always a favorite! GREEN MIRRORS!! So fabulous Tina. I saw one bout a year ago at a beautiful shop in Chicago for about $3000 so your prices are crazy good! My favorite is the chinoiserie figurine mirror in the blue and white. Just gorgeous!!! I think the tole planter-#1 is beautiful! Would look so pretty in my home. Love the tray tables! Just the perfect size to tuck beside a chair or for use as a serving tray for friendly get togethers. The bamboo legs have the natural yet elegant style that would fit comfortably in any setting. Love the beautiful colors for the mirrors! My favorite is #6 the tray table. Favorite color is ivory. Such beautiful and timeless pieces. LOVE LOVE LOVE the figurine mirrors. I have eyed them for a long time for a bathroom. Thank you for offering such wonderful and unique pieces. I love anything chinoserie!!! It’s all lovely, but my favorite is the tole tray table! 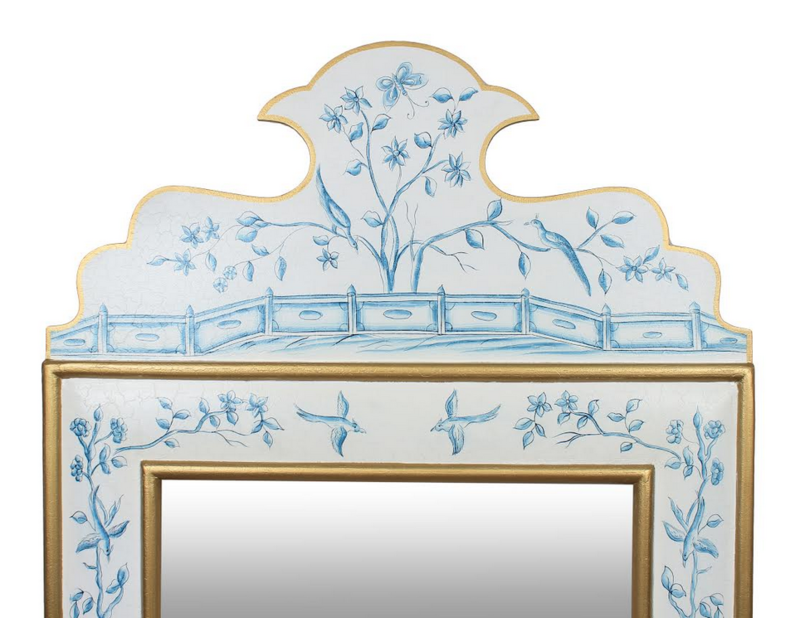 My most favorite Item is the blue and white chinoiserie mirror! I love the look- it is beautiful and very well priced- I just recently bought a similar mirror and paid a lot more money! My daughter-in-law just told me about you- in lovvve with your stuff!! 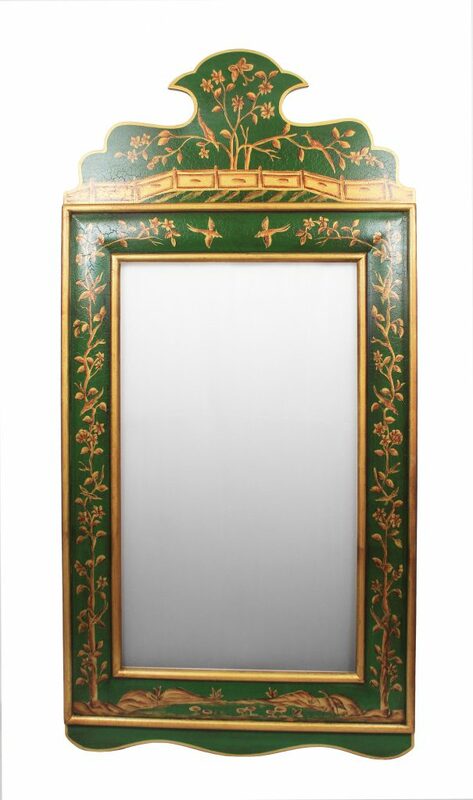 Just ordered one of the mossy green mirrors. Can’t wait to see it with my blue and white accessories! Love the black tray table.. my mom had one and I always thought it was so elegant! LOVE ❤️ anything in a tole planter…. Iced drinks to any floral-topiary display. Love the green and gold mirror! The planters are absolutely gorgeous! I love all the different colors! Wha a great addition to my sun porch! Such an excess of riches! This is really difficult… but I have to go with the round tray tables. 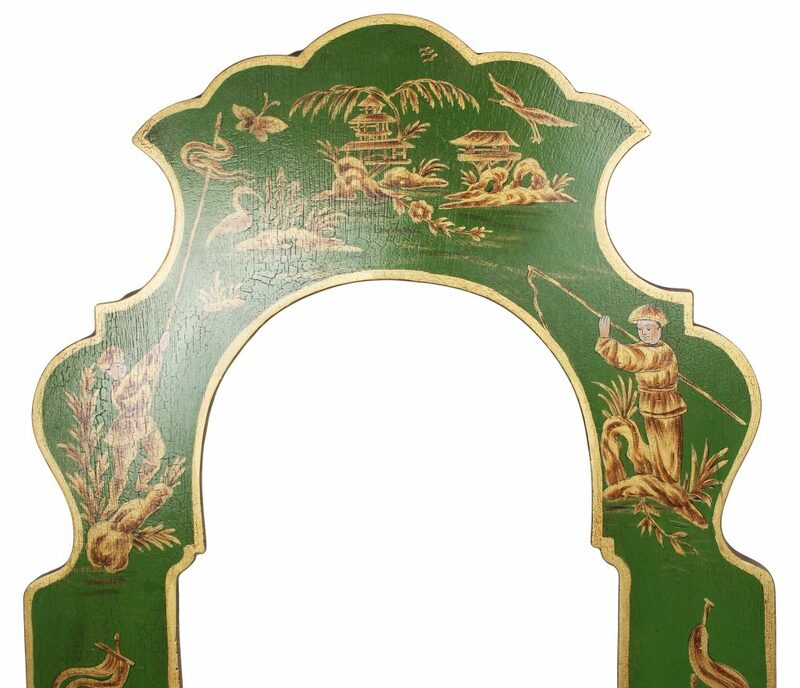 The intricacy of the chinoiserie images is so much like what one would find on an antique. The black is so dramatic! I love the pale blue/gold tole planter!! Love the mirrors. I am redoing my bathroom and would love to get two of these for double sinks. I love tole collection! The black and gold tray table is my favorite. I love the tole collection! The black and gold tray table is my favorite. Hi Tina! I wish you could;d come and help with my house! That would be a incredible give away! I love all your items. The way you put it all together is a real gift!! Love the tables and the mirrors….actually, I love all of it! 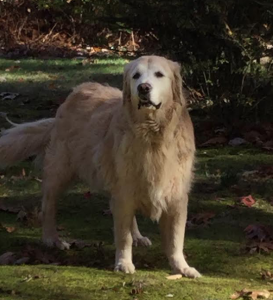 So elegant. The black tray table is great! It is versatile, even for a small space. Love the tray tables especially th e black one. My favorite is the tray table in the black and gold colorway. It feels bold yet classic. I’ve seen similar looking antiques go for much more so that is my pick.